Every now and then, a seller surprises us with a treat that commands attention. This time it is the Audi TT that goes under the hammer on bidorbuy in the first week of April 2009. The auction opens on Thursday 2 April at 9 a.m. and ends on the same day at about 3 p.m. The starting bid is R1, and there is no reserve. The Audi TT in question is a 1.8 Turbo 2001 model. It is a manual six speed transmission car with the trimmings usually associated with a vehicle of that category, like aircon, power steering, central locking, electric windows, height adjustable steering wheel, ABS, sound system with a tape and a six-disc CD shuttle, and so on. The seller of Audi TT, Miss Sale, has already sold two second-hand cars on bidorbuy R1 auctions: a Jaguar S-Type in February 2009 and a Mercedes-Benz CLK320 cabriolet in November 2008. You may read more about the Mercedes auction in an article published on bidorbuy, entitled The anatomy of an auction. In her listing for the 2001 Audi TT, the seller says: â€œI will guarantee that car is in perfect running condition and that there are no funny noises from engine etc.â€ Judging from her two previous car sales on bidorbuy, MissSale is as good as her word. â€œFast and friendly serviceâ€, says the buyer of the Jaguar nelhm about her. The Merc buyer pepper007 regards MissSale as a “very straightforward sellerâ€ and says the following about the auction in which she won her new car: “What a stunning experience – crazy but wonderfulâ€. 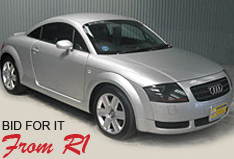 To bid for the 2001 Audi TT on Thursday 2 April, you need to have either ready cash or an assured finance line. If you opt for the latter,Â you will be able to see the monthly installments at every moment during the bidding, thanks to the new bidorbuy functionality included in the listing. Since the starting price is R1, the monthly repayments currently stand at R0.02 over 60 months at 13.0% interest (based on a 10.00% deposit). Those two cents are certain to go up considerably by the time the auction ends. On the up side, judging by all the indicators, the interest rate is set to fall. South African bloggers are invited to guess the highest bid for the Audi TT. The winner will get a R300 cash prize. The competition rules are posted on the Best Guess page.